I've been painting French troops for decade and I realize that I've never deepened the question of the most correct blue to use. Some years ago Master Color produced a specific colour defined French blue but I frankly can't remember whether it was really adequate. Perhaps the question has already been dealt with in the Forum in the past. Have you got any suggestion on such a subject? Giovanni, lots of blue colors are good as long they aren't to dark! I use the Foundry French blue triad but I find the base is too dark so I use the light (color 65C) for the base and the base (color 65B for the shade). For highlights I mix in Citadel Dark Reaper to the base color and for second highlight I mix in Citadel Thunderhawk Blue into the highlight mix. I use GW Mordian blue (now Maccrage blue) as base and Ultramarines blue (now Altdorf Guard blue) for highlights. For a second round of highlights I mix ultramarines blue and white. That blue would be okay. You could vary some tones lighter or darker as well - those days, uniforms were not manufactured industrially and therefore, not every blue looked the same. As manufacturers also used different sorts of dye, the colour fading process made uniforms from different manufacturers turn out to look much different after a longer period of time. Zed1 wrote: That blue would be okay. You could vary some tones lighter or darker as well - those days, uniforms were not manufactured industrially and therefore, not every blue looked the same. As manufacturers also used different sorts of dye, the colour fading process made uniforms from different manufacturers turn out to look much different after a longer period of time. Even in this days this comment counts! If I want to buy a new uniform I have to buy a vest and trousers. Every four, five years they change from manufacturer! When I started my military service, they handed me over three sets of field uniforms. The sets contained one trouser, one jacket, a t-shirt and a button-down-shirt. They all had the same colour - standard khaki. I always kept one of them especially for outside service in order not to have all uniforms dirty before the weekend. One I tried to keep in reserve for indoor service just because of personal preferrence. This resulted in the effect that one or two sets were often and heavily exposed to sunlight and had to be cleaned very often while one was not. In the summertime, button-down shirts were often not worn due to the heat outside. We kept them stored in our wardrobes - and after summer had passed, they'd been washed a lot lesser then the rest of the uniforms. In addition, some comrades had a bad tendency to wear one single dress all week long because they wanted to prevent to have to carry a heavy sack full of laundry back home. So after one year had passed, you might imagine how a full company of soldiers looked like - there was almost not a single soldier that looked like the other one when it came down to the colour tone of his uniform. We were literally 'fifty shades of khaki'. 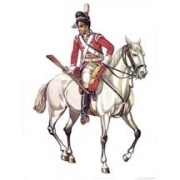 Color of uniform during the battle. I am far away to be an expert for the Napoleon war time. The only touch with that till today is the book I bought in 2015. In it is written that there was a amount of fallen British soldier. And due to heavy rain (a thunderstorm if I remember correctly) during the night ALL there ex red uniform was now a kind of pink ! There the raindrops can hit it. During my build, search and already shown Dio: "Defend the Oder" I came across that Seydlitz troops are easy to identifies in the confusion during retread. One thing was that they wear German uniforms too. But not battle dirty and not worn out or torn ! So who is the right color? The one who is shown in a pic? Print on which paper quality? How much g/qm ? Is the page with the illustration, pic covered with a dull or glossy varnish ? How many dpi, lpi is chosen? Same for tank color. RAL system. Nice. How many shortcoming of supply did the factory get? How often the color was reduce in the factory, in the field? And you CAN`T identify colors by b/w photos as I read sometimes in other Forums. From Model Color and Andrea Color! Pictures like FreG show us is a great support. And a dark color is a dark color for base paint. Dot. The variation, rendition is up to the modeller in my opinion. Conclusion of my long speech. Do not slave yourself (as I do in the past) in fix color rules. You can`t do it right. Follow the examples, pic. I do what I think it is right in shades, variations. (I use booth colors as shown in the pic in the same Dio for different figures a a base color) And simply do it ! A good example right now is my current build: Maresal in the work in progress section. Then you like your work and it will be nice. Figures from the time show that on the treat from Corunna more infantry was lost through lack of footwear than enemy action. Officers fared little better with privately made boots*. The problem was solved when Brunel (Marc Isambard, the father, not his son Isambard Kingdom) designed a new boot which, for some reason, wasn't adopted until 1815. *One Officer's boot maker was reported as saying indignantly that he made the riding boots in question for riding NOT for walking to the stables .